When it comes to cleaning up your diet and/or losing weight, I usually start by making one suggestion. However, more often than not, I’m met with staunch resistance. It’s surprising to me because this one tweak alone could help you drop 26 pounds in a year. One change, 26 pounds—you gotta like that number. If this one “food” is a staple in your diet, you’ll understand why people put up a fight. The simple truth is most people simply don’t want to part with their pop! Check out these fizzy facts: Soda is 100 percent nutritionally void. That means that there is absolutely nothing redeeming about the beverage—no vitamins, no minerals, no nutrients that will help you in any way. The only thing it adds to your diet is calories—about 245 per 20 ounces. Oh, and don’t forget about the sugar. You’ll find about 65 grams of the sweet stuff in a 20-ounce bottle. So, at roughly 16 teaspoons, it’s basically liquid candy. Wondering if diet soda is a better option? Sure, it’s calorie-free and doesn’t contain any real sugar, but it’s not necessarily a healthier choice. Some research suggests that people who consume artificially sweetened products are more likely to gain weight than lose weight. Scientists aren't quite sure why, but there is some evidence from animal studies that artificial sweeteners in diet drinks (like saccharin, aspartame, or sucralose/Splenda) can increase appetite and lead to weight gain. Plus, certain people seem to make up for the calories saved from sipping diet drinks by consuming more calories from food throughout the day. 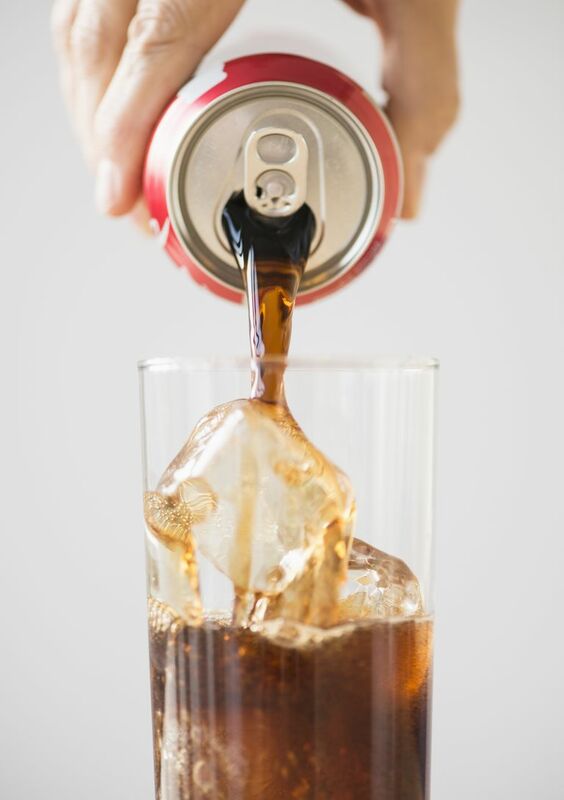 If you're drinking diet soda in place of regular and keeping track of your total calories, it can help with weight loss. Even still, I’d recommend limiting yourself to one can daily. But ideally, try enjoying a better-for-you beverage (like one of the ones listed below) instead. Many of the people I’ve helped over the years have been serious soda drinkers. Some of them guzzled down 2 to 3 liters a day. These empty liquid calories (all from sugar or high fructose corn syrup) may be partly responsible for fueling the obesity epidemic in our country. Not to mention, liquid calories don’t fill you up like the calories from foods do. How’s this for a weight loss win: Cutting just one 20-ounce soda each day for a year would save you 108 cups of sugar and 91,000 calories, which could translate to a loss of 26 pounds. Nixing these liquid calories is often one of the first and most effective steps to losing weight. It should come as no surprise that soda can cause tooth decay. After all, it’s loaded with sugar. But the acid in the fizzy fix also does a number on your chompers. Some studies show cola may weaken your bones. Although experts had originally suspected that the caffeine and/or phosphoric acid in soda may be to blame, recent research suggests it may be as simple as the fact that the beverage has replaced calcium-rich milk in our diet. Soda can send your blood sugars soaring, increasing your risk for type 2 diabetes. One study found that people who drank a can or two daily were 26 percent more likely to develop the disease. Studies show that a diet high in sugar is linked to high cholesterol and triglyceride levels, both of which are considered major risk factors for heart disease. In fact, a study indicates that drinking one can of a sugary beverage daily can increase your risk for heart disease by 20 percent. Good old-fashioned water: No surprise here. It’s one of the best ways to refresh and re-energize. Naturally flavored seltzers: It's not only a must-have for the fridge, but it's also a great way to help you slim down. Unsweetened tea (hot or iced): Need a little more flavor? Try a zero-calorie unsweetened flavor tea. Unsweetened coffee (hot or iced): Keep your cup low-cal by choosing fat-free milk and skipping the flavored syrups. By Joy Bauer, MS, RDN, CDN, Health and Nutrition Expert for NBC’s Today Show and founder of Nourish Snacks. Joy’s latest book is From Junk Food to Joy Food.